Tello Mobile has a new promotion. New subscribers will get a $25 account credit when they signup with the Sprint based provider. Customers have until April 4th, 2019 to take advantage of this offer. Customers will receive the account credit as soon as they place their first order. It is for newcomers only, so if you previously signed up with Tello Mobile you are ineligible for the promotion. Those who take advantage of this deal will be able to use their account credit to either pay for their phone bill or to purchase a phone. Unfortunately, partial payments are not allowed at the moment, which may restrict how you can spend the credits. With an active account, the credit will remain in your account forever or until it gets spent. However, if your account becomes inactive and you don't place a call, send a text message or renew your plan for a period of time lasting longer than 6 months, you will forfeit the credit. The plans just described all include unlimited talk, text, and data with the specified amount of data at 4G LTE data speeds before throttling to 2G or about 64Kbps. Mobile hotspot and unlimited calling to Canada, Mexico and China are also included with the plans. 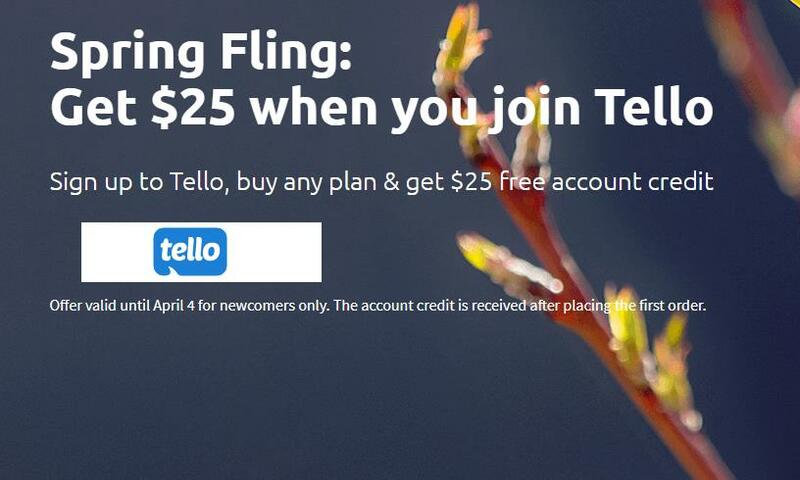 If you would rather use your account credits on a phone instead of a plan, Tello offers nearly 30 phones for purchase. Most phones sold are sold refurbished. Prices range from $25 for the refurbished Alcatel Cinch to $699 for a new Apple iPhone 8. Tello phones are sold free of contract and unlocked.